Islamabad (Agenzia Fides) - "We are called to build peace in the world and give our contribution in the fight against terrorism that leads to the death of innocent victims, we condemn any form of attack against religious minorities, those that took place in Pakistan as well as in New Zealand that killed the lives of our Muslim brothers, we express our solidarity with the families who lost their loved ones in the Christchurch attack where nine Pakistani citizens also died. We are close to them and pray for them. In this time of Lent let us fast for peace, against all forms of terrorism": as Agenzia Fides learns, this is what Archbishop Joseph Arshad, bishop of Rawalpindi-Islamabad said during a prayer vigil for peace and to say "No" to terrorism in the cathedral of Rawalpindi, on the evening of Saturday 23 March. Hundreds of faithful, priests and religious took part in the prayer vigil. 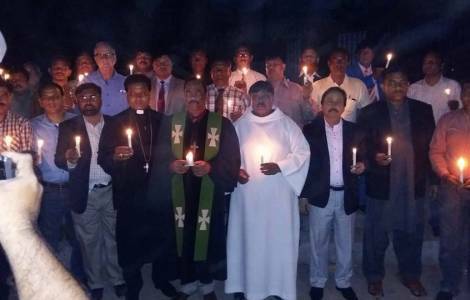 Archbishop Joseph Arshad, who is also president of the Catholic Bishops' Conference of Pakistan, expressing firm condemnation for the attack in the country of the New Continent, remarked: "We are dismayed and we are all called to do our part, in every nation of the world. The massacre of Muslims in New Zealand shows the growing wave of extremism and radicalization that is making headway all over the world. And it shows that terrorism has no religion or national boundaries. Terrorism profanes the name of God". Cardinal Joseph Coutts, Archbishop of Karachi, also expressed the feelings of Pakistani Christians and condemns "the horrible attack on mosques in New Zealand" and defined Naeem Rashid, the Pakistani teacher who sacrificed himself trying to block the killer, "a national hero". The Cardinal invited the faithful to live the Lenten season with this spirit. "It is a time of prayer, fasting and penance", he said. "We are called today to pray for all the victims of violence and terrorism, to work for justice and for peace", offering "with all our heart, our profound solidarity and our affection for our Muslim brothers and sisters, in this moment of suffering". Speaking of the gesture of Naeem Rashid, Mgr. Coutts notes that "we Pakistanis are people of peace and that we are able to sacrifice our lives for others". In the nation, citizens of different faiths (Muslims, Christians and Hindus) have given rise to protests and solidarity events and demonstrations in recent weeks, organizing prayer vigils that have involved the believers of all religious communities. Saleh Diego, Vicar General and Director of the "Justice and Peace" Commission of the Archdiocese of Karachi, appreciating the unity shown by the whole Pakistani nation, notes: "We are saddend to see, in Pakistan as well as in New Zealand or in other parts of the world, men who, inspired by a fundamentalist ideology, kill for religious hatred. We are all children of God and brothers in humanity".